The heavy gauge cut to length line is designed for material thicknesses larger than 1/2″ (12.7 mm). By alternating between corrective leveling and plate flatteners, a wide range of input thicknesses can be accommodated. 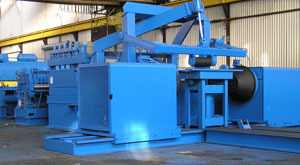 Heavy gauge lines utilize large scale mechanical or hydraulic shears for cutting material, also known as Stop-Go CTL. With heavy duty stacking sections allow for handling bundles of cut plates. Due to the increase of thickness of the material, a more robust peeling and material handling section is used. Heavy gauge line are also useful for the processing of exotic alloys with higher shear strength ratings. Element lines use high resolution feedback devices to provide tight cut tolerances across any length of piece. Our most accurate cut to length lines can reach up to 1/8 ASTM standard cut lengths. Element has supplied heavy gauge cut to length lines for up to 1″ x 120″ (25.4 x 3048 mm) mild steel strip. 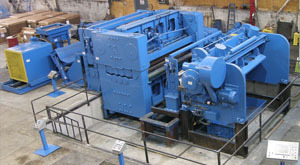 As an industry leader in heavy gauge processing lines, Element equipment is supplied with power and safety factors to allow for the demanding stresses of processing thick material. Our Cut-to-Length lines have met a wide variety of multiple applications. They have been used in different industries with the following options.